This article is about the French department. For the historical region of Savoy, see that article. For other uses of "Savoie", see Savoie (disambiguation). For other uses of "Savoy", see Savoy (disambiguation). Together with the Haute-Savoie, Savoie is one of the two departments of the historic region of Savoy that was annexed by France on 14 June 1860, following the signature of the Treaty of Turin on 24 March 1860. For history before 1860, details of the annexation, and modern regionalism, see Savoy. It is widely accepted that Savoie takes its name from the Latin Sapaudia or Sabaudia, meaning land covered in fir trees. Savoie was long part of the states of Savoy; though beginning in the 16th century, it was occupied by France several times. It was integrated into the Mont-Blanc department from 1792 to 1815 (and partially into the Léman department from 1798 to 1814). The province was annexed by France in 1860. 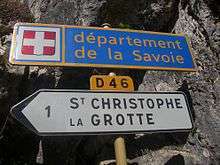 The former Duchy of Savoy became the two departments of Savoie and Haute-Savoie. Moûtiers, capital of the former province of Tarentaise Valley (French: Vallée de la Tarentaise) ceased to be the prefecture (seat) after a law passed on September 10, 1926. Savoie, along with Albertville, hosted the 1992 Winter Olympics, with ski events at Tarentaise and Beaufortain. The other main alpine valley is the Maurienne, connected to the Tarentaise valley by two passes, the col de la Madeleine and the highest pass in Europe, the col de l'Iseran. The Maurienne valley was through the col du Mont Cenis, the major commercial route between France and Italy. It is one of the longest intra-alpine valleys in the Alps. 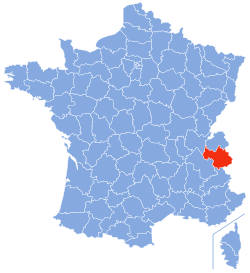 Savoie is part of the Auvergne-Rhône-Alpes région. It borders the departments of Haute-Savoie, Ain, Isère and Hautes-Alpes in addition to Italy. The department is crossed by the Isère river, which has its source in the Iseran pass. Its two main lakes are Lac du Bourget (the largest and deepest lake entirely in France) and Lac d'Aiguebelette, one of the least polluted in France due to a 1976 law forbidding any use of motorboats on the lake. Low elevation: The Savoie frontcountry. Mid elevation: Mariet plateau in the Bauges Massif. High elevation: the village of Sainte-Foy-Tarentaise. According to the Chambéry chamber of commerce, close to 50% of the department's wealth comes from tourism. Each year, Savoie hosts over 30 million visitor-nights of tourists. Savoie also profits from its natural resources with particular strengths in ore processing and hydroelectric power. Savoie had an exceptionally high export/import ratio of 214% in 2005. Its exports rose to €1.768 billion and €825 million in imports. Its leading exports were steel, aluminum, and electric and electronic components. Numerous wine grapes are also grown in Savoie. The most famous wines are made of Gamay, Pinot noir and Mondeuse grapes. Fruit production is the third largest component of agriculture in Savoie. Apples and pears are also produced in the region and are well known for their qualities. Residents of Savoie are known as Savoyards, though they can also be called Savoisiens (the historical name) or Savoyens. The "average" (see arithmetic mean) population density is not a good indicator: the valleys tend to be much more densely populated, whereas the mountains tend to be near-completely uninhabited. The Catholic Church in Savoie is divided into three dioceses: Chambéry, Maurienne, and Tarentaise. Together, they form an archdiocese, in which the bishop of Chambéry is the archbishop. Lac du Bourget The largest lake in France.